Jennie Tomao was born in New York City where she attended the prestigious New York School of Music and Art. She received an Award of Excellence from the Pittsburgh Institute of Art. 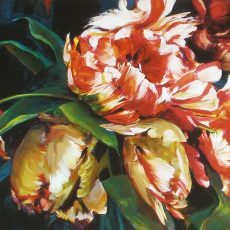 She has been painting art, prints and posters for over 30 years. She is renown not only for her magnificent landscapes but also for her traditional art, prints and posters of women and children in imaginative settings, and her exquisite life-like flowers arranged in elegantly detailed vases. Her palette is both jewel-like and muted. Light glistens off the focal objects, sometimes actually flowing with their inner radiance. 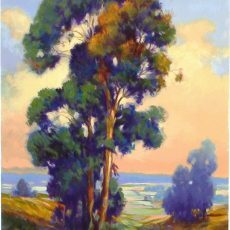 Her style is strongly reminiscent of George Innes in its quiet feeling of warmth and space. Tomao has exhibited her art, prints and posters in Long Beach, Beverly Hills, Pacific Palisades, San Diego, San Francisco, Palm Desert, Portland, Vancouver, New Orleans and Palm Beach.